Capcom has confirmed rumors, announcing a portable sequel to cult hit Okami - Okamiden: Chiisaki Taiyo for the Nintendo DS, starring wolf-god-puppy Chibiterasu as he paints his way through the stylized feudal Japan of the first game. Last week, rumors started circulating following the discovery that Capcom had registered the name Okamiden, spurring hope that fans of the beloved cult hit Okami might have a sequel on their hands. Earlier today, we saw Famitsu scans that appeared to show a new Okami game for the DS. Now, we have confirmation: The two games are one and the same, as Okamiden: Chiisaki Taiyo will be debuting at the Tokyo Game Show at the end of the month, translates 1UP. "As you know, Okami's visuals and game system are extremely unique," he said. "The original idea was to take what makes this game special and expose it to more people. That was why we chose the Nintendo DS -- being on a portable system will allow people to easily pick up and play it, and you can also use the touch pen as a brush." Okamiden will not start Amaterasu, the goddess-in-wolf-form heroine of the first game, but it will take place in the heavily stylized fantasy feudal Japan of the first game. 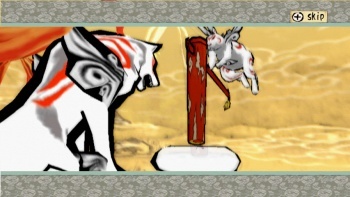 The player will play as Chibiterasu ("chibi" being Japanese for "small" or "diminutive,") an entity that reportedly resembles a puppy version of Amaterasu's wolf form. Whether or not he (or is it she?) was the offspring of the goddess was still a "secret," said Eshiro, though he did say that though the wolf-pup would have access to most of the abilities the elder divinity had in Okami. The demons defeated by Amaterasu in the first game have returned to stir up trouble, and it's up to Chibiterasu to set things back to normal. As before, the gameplay will be centered around the use of the magical brush, painting on the screen with the stylus to solve puzzles and defeat enemies. A new aspect of the game will be its partners, who will work together with Chibiterasu as the game progresses. "The basic theme of returning life and nature to the world is the same as in Okami," Eshiro said. "What's different is that the relationship with your partners will be given just as much weight storywise. The themes are the same, but the nuances are different." Okami is truly beloved by most of those who have played it (all thirty-eight of them) so this can only come as good news for fans of the first game. We'll find out more about Okamiden when it makes its debut at the Tokyo Game Show.